I have always been fascinated by the relationship between bodies of water and architecture, whether that be pools, ponds, fountains or even dry gardens imitating riverbeds offering the illusion of water or views of the ocean or river vistas, adjacencies to lakes or creeks, there is something magical the way in which water when harnessed properly can anchor a home to its surroundings non more so than the most famous house in the world Falling Water which although a masterpiece in its own right its relationship with the waterfall it is precariously placed over elevates the home to heavenly heights, in pictures it is something amazing, but I was fortunate enough back in 2013 to make the pilgrimage there in person and let me tell you it is something out of this world to experience in person and however great the photos are they simply do not capture the essence of the place or in achitecture wankery the ‘genius loci’. Water features can animate a static environment and also contribute to a psychological feeling of wellness and tranquility. Not only does the principle of air passing across water physically cool you down I believe that simply looking at bodies of water has a positive psychological effect- I have no peer-reviewed journal articles or periodical is to back up this (I’m sure I could find some if I wasn’t so lazy) it is simply a personal observation, light reflecting off the mirrored surface of water can also engender a much grander, more spacious feeling to particular place- in the same way adding mirrors to a room subconsciously conjures a feeling of spacial generosity and compensates for a lack of windows. There are many fantastic examples here on the Sunshine Coast in Australia in general of architecture which incorporates water and water features immensely beautiful where is the rock also a myriad of examples in places such as Indonesia and Singapore, both of which benefit greatly from the cooling benefits of bodies of water pleased strategically as both countries share a hot humid tropical climate not dissimilar to the ancient Middle Eastern passive air-conditioners called ‘Badgirs’ which use a passive low tech system of drawing warm wind over bodies of water in their basement to cool the house naturally. A fantastic example of Singaporean architecture which incorporates large expanses of liquid is this home by WallFlower Architects. A great example of something which is minimalist but also feels welcoming is the work of architects Suyama Peterson Deguchi most notably their projects ‘Broadmoor’ & ‘Fauntleroy House’ (Pictured) there is something magical about their use of timber water and concrete, the simplicity and elegance of the deck over pond in Fauntleroy is an image which had caught my eye on many occasions and took me a long time to locate it’s creators. Many lessons can be borrowed from these aforementioned exemplary case studies you do not need millions of dollars worth of infinity pools or even a view of the ocean in order to benefit from a strategically placed water element – even a well thought out shallow pond or Lilly pad covered dam can be a perfectly nice substitute for a millionaires ‘ocean glimpses’ or a massive concrete lap pool. The koi pond at Singapore’s Changi International Airport has often brought me comfort, during a stop over on a long haul flight after 12 hrs in cattle class just watching the fish lazily glide through the water has a zen-like effect on me calming me in an instant. 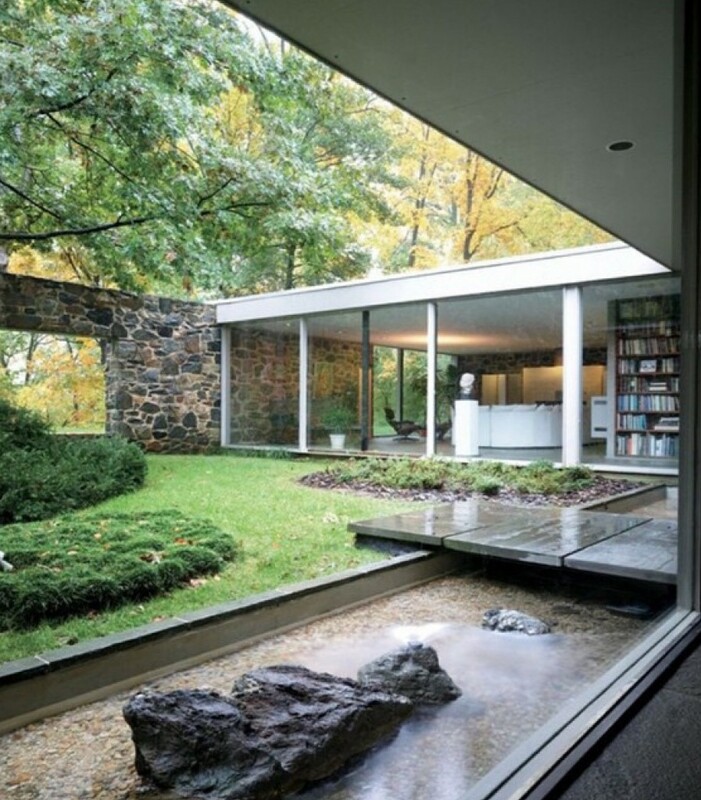 One of my favourite houses in history which exemplifies this is Marcel Breuer’s 1959 Hooper House II (pictured above) the house opens onto a shallow body of water and a lush green courtyard, the project has a very Japanese essence which is in part due to the placement of a large feature rock in the pond, reminiscent of a zen garden in Kyoto the water is traversed via a stone bridge of sorts and creates drama and intrigue animating an otherwise static space. Breuer enclosed a private courtyard with a rock wall which is both a modernist staple and also something more ancient and monolithic, the wall has a large rectilinear aperture which frames one particular view of the landscape and makes you appreciate the view more, rather than allowing you the full gamut of greenery it is presented in an oversized picture frame of sorts and cropped just as a photographer would do. And finally one of my all time favourite Australian Architects Robin Boyd’s Featherstone house design. Which is such an amazing composition of inside and outside with the addition of greenery and water.